The weekend of the 29th of April until the 30th of April Satunama staff and members of the Guyub Bocah organisation organised a weekend at Pantai Watu Kodok in the Gunung Kidul regency. They were joined by different youth organisations; Beatrix and Pinggit Community. Three different workshops were held throughout the weekend; training of trainers for Guyub Bocah members, workshop on multiculturalism and workshops on disaster risk management. As we were setting up our camp on Saturday I could feel a sense of excitement as all the groups started to arrive. As evening dawned the workshops started. 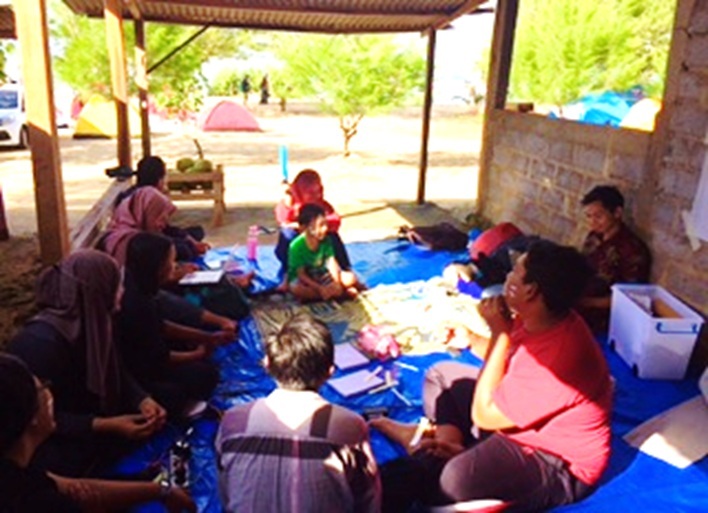 The workshops were held in the warungs along the beach that were used as classrooms. The whole atmosphere gave a sense of being part of nature and part of a collective community. During the first training of trainers workshop on Saturday night, four young adults, Adit, Krisna, Anik and Putri of the Guyub Bocah organisation came together with Shinta their facilitator to develop their leadership, public speaking and interaction skills. The exercises that they were doing were focusing on gaining more confidence to create and lead programs for Guyub Bocah activities. The aim is to be able to advocate rights issues and create effective children’s programs that will see every kid participating in. They discussed the importance of public speaking skills and their behaviour as a trainer to educate children. Throughout the workshop Shinta gave them advice on how to effectively lead children’s activities in order to engage with every child. The four young adults were full of ideas on how to create, implement and lead activities, which gave me a sense of excitement. Excitement that young adults are trained on right’s issues but also on how to educate generations after them. It made me realise how important training young adults is as they will our future. After the workshop on training of trainers came to an end another workshop started in the warung next to it. This discussion was on the issue on Sultan’s ground in the Gunung Kidul regency, specifically focusing on Pantai Watu Kodok. For this discussion, the different youth groups as well as Satunama staff and Guyub Bocah members were present. While in the first workshop Guyub Bocah members are learning leadership, interaction and public speaking skills, the next workshop gave them a real example on a rights issue; land right issue in Yogyakarta. By attending this workshop, they were able to learn firsthand about the importance on land rights and the issues that people are facing within this region. Being able to learn about rights issues first hand enables them to spread their knowledge in order to educate Guyub Bocah children. As the members of the groups came from different parts of Java and being of different backgrounds lively conversations were held to get to know each other better until late into the night. Going to sleep in my tent that night I felt a sense of collectiveness; groups of people from different backgrounds coming together and creating a new community who share the same values and goals. 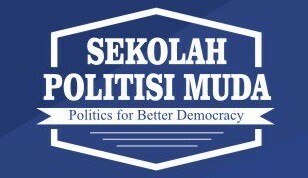 While knowing that the Guyub Bocah organisation is educating young adults to fight for their rights and their future. The second day we woke up around 5am as the sun started to emerge. I went for a walk along the beach and looked back towards the warungs were the workshops were held. What makes this weekend special was that we were able to get to know the area while creating a special sense of place. The sense of connecting oneself with the place, the issue and the people. At 6am the second workshop on training of trainer started. This workshop concentrated on active participation of the members of the Guyub Bocah organisation. The focus of this workshop is on story telling skills. The facilitator for that workshop is a teacher who is a member of the children’s rights community. He thought them skills on how to tell a story or to lead a group activity in an interesting way, so everyone wants to participate and learn. He thought them how to engage with their audience and make learning a fun activity. The exercises that they were doing were also meant to boost their confidence to be a trainer and to become an engaged leader. Activities such as story telling through songs, role play and other fun activities were practised. After a few hours of practice they went to a nearby village and put their theory into practice by doing activities with the children there. This training that Satunama does for Guyub Bocah is an essential program to educate the next generation of young adults on how to become advocates for children’s rights issues. The focus on teaching these young adults is an essential component as it’s young people like them that will shape our future. The more young people are to become active advocates for children’s rights, the more opportunity is created to make a change. That is why Guyub Bocah is such an important organisation for the future of Yogyakarta, Java and the whole of Indonesia. It is them that will fight for children’s rights. Training these young adults on leadership and advocacy will shape the future. While the members of Guyub Bocah went and visited the village to do activities with the kids there, two workshops were running simultaneously. One on disaster relief management and the other one on multiculturalism. I was asked to share my experience on multiculturalism in Australia and here in Indonesia with the youth group. We had a discussion on our experiences on multiculturalism, while comparing our different experiences with one another. We further discussed issues such as inclusivity, stigmatisation and the importance on acceptance within our society. This workshop gave me a sense of hope. Hope that we are able to continue our friendship regardless of our backgrounds and that we are able to start a community that prides itself on acceptance and inclusivity. I felt very privileged to be able to have shared this weekend with the different youth groups that attended all the workshops. To engage the youth in right’s issues is such an important matter these days. If we want to make a change we have to be able to engage the next generation in rights discussion. This is why the work that Guyub Bocah does in corporation with Satunama is important. They are educating our next leaders, our children to become a part of the rights discussion on a local, national and international level. Guyub Bocah is giving the youth the opportunity and the confidence to become trainers, advocates and leaders and educate the next generation on their rights.